In October 2016 Dovetail Cultural Resource Group conducted data recovery excavations at a multi-component site with the primary core representing an early-nineteenth through early-twentieth century domestic occupation (31RD1426&1426**) located in Randolph County, North Carolina. The project was completed on behalf of the North Carolina Department of Transportation, in compliance with their Data Recovery Plan, and the overall Phase III assemblage contained nearly 25,000 artifacts. 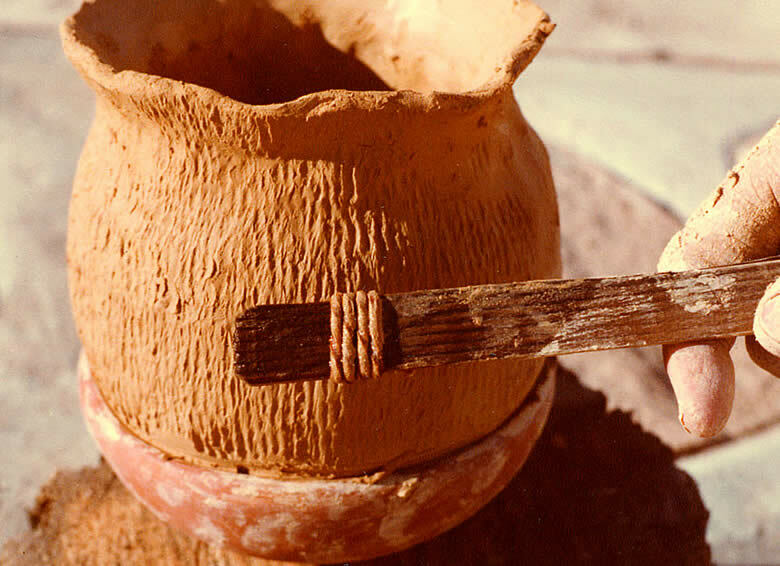 This blog is the first in a series of entries highlighting the plethora and variety of objects recovered from the site. The first artifacts discussed in this series are a pair of cast iron andirons, sometimes referred to as fire dogs. These form a matching pair but neither is complete however they mirror the pair shown in the image below. They are in different stages of corrosion and were recovered from separate contexts approximately 20 feet apart on either side of the central chimney once associated with a standing dwelling. Andirons Recovered From Site 31Rd1426/1426**. Image Showing Complete Set of Andirons in the Same Style as Those Recovered From Site 31Rd1426/1426** (Wiles 2017). Andirons were used in fireplaces to elevate large burning logs. This allowed oxygen to easily circulate around the logs and feed the flames, rendering a more efficiently burning fire. Because fireplaces often served two purposes, heating a room and as a heat source for cooking, it was important to have a constant fire in the hearth; this was greatly aided by the andirons. Eastman Johnson Painting “The New Bonnet” Showing Andiron in Similar Style to the Ones Recovered From Site (The Metropolitan Museum of Art [MET] 2017). Andirons have been used in fireplaces for centuries. For those with means, andirons were often highly embellished and served in both their utilitarian capacity and as an interior decoration. The practice of using andirons as a canvass for artistic expression began during the medieval period when blacksmiths began adding embellishments to andirons. For example, an andiron from the fourteenth century was forged with a serpent head extending from the top (Apartment Therapy 2018). Throughout the Renaissance period and into the eighteenth century, andirons continued to be designed with motifs such as ancient Greek and Roman statuary or molded in the form of animals. An elaborate set of andirons on display at the Museum of Fine Arts in Boston were reportedly used by Marie Antoinette at Hameau de la Reine, the Queen’s rustic retreat, located in the park of the Chateau de Versailles. These andirons display two goats eating grapes from a central urn. Beneath the goats is a relief of cupids and grape vines (Museum of Fine Arts Boston 2018). French Andirons (Museum of Fine Arts Boston 2018). While decorative andirons clearly reflected the tastes of their owners, the andirons found at site 31RD1426&1426**—although plain—speak volumes. The occupants of the site were tenant farmers who eked out a meager existence in the North Carolina Piedmont but they still sought technological items that helped to render a more efficient (and warmer!) household. So, as you are sitting in your home this winter trying to stay warm, contemplate the possible shapes and styles of andirons and what you may have commissioned if you had the monetary freedom to do so. 2018 Quick History: Andirons. Electronic document, https://www.apartmenttherapy.com/quick-history-andironsretrospe-149729, accessed January 2018. 2017 The New Bonnet, Accession Number 25.110.11. Electronic document, https://www.metmuseum.org/toah/works-of-art/25.110.11/, accessed January 2018. 2108 French Andirons. Accession Number 27.521.1-2.11. Electronic document, http://www.mfa.org/collections/object/andiron-505383, accessed January 2018. The “Clear” Benefit of Bottle Glass. And Wire Nails. And Sewer Pipes…. One of the questions we get asked most often with our work revolves around artifact ownership. In many states, all artifacts recovered from private land during Section 106 review rightfully belong to the person who owned the property at the time they are excavated (ACHP 2009). As such, coordination with landowners is essential. Dovetail works with the landowners to assure that their artifacts are returned to them, but what is retrieved often isn’t what they expect. A large percentage of the population believes that during an archaeological excavation only complete objects of monetary worth are recovered. The reality is, we find and collect broken stuff. We dig up people’s trash from the past, most of which is not desirable to anyone but an archaeologist who has spent days/weeks/months digging in the dirt to find it. But as the saying goes, “one person’s trash is another person’s treasure.” As archaeologists we love the broken bits and use these fragments of dishes, bottles, smoking pipes, jewelry, etc. to piece together information on the people that lived in a particular area. Many of the artifacts we typically find date to the late-nineteenth to early-twentieth century, when large-scale commercial manufacturing allowed for faster production of items like glass, nails, and plastics. Faster and easier production meant that they were more affordable. This, in turn, made those items more readily available to consumers and thus seen as more disposable. Typically, for this blog we like to highlight a particularly interesting object or collection of artifacts. However, in an effort to show what standard finds are during survey work, please enjoy the pictures below showing the types of artifacts we most commonly see. Are they worth a fortune? No. But are they invaluable to our understanding of our past? Absolutely…. Top row from left: White clay pipe stem, clear lead-glazed redware, two whiteware plate fragments. Bottom row from left, ungalvanized wire nail, machine cut nail, collection of window glass. From left: Red automobile tail light fragments, clear vessel glass, and collection of clear bottle glass. 2017 ACHP 2009, http://www.achp.gov/docs/ACHP%20ARCHAEOLOGY%20GUIDANCE.pdf, accessed September 2017. In 2016 Dovetail conducted an archaeological excavation at the Historic Huntley House in Fairfax County, Virginia. This work was completed at the request of the Fairfax County Park Authority as part of their Huntley Tenant House Rehabilitation Project. Dovetail surveyed portions of the property surrounding the tenant house as well as the interior of the building. 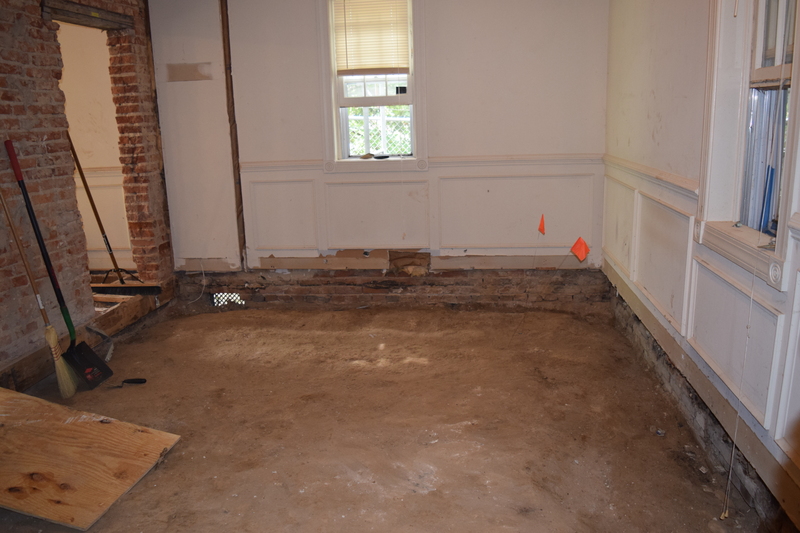 This was a unique case where the floorboards of the tenant house had been removed prior to the installation of new flooring, revealing the soils below the dwelling and allowing archaeological access to an often-hidden living surface. Dovetail’s excavations inside the house primarily focused on the builder’s trench (an excavated trench for the placement of a brick or stone foundation) in the southwest room of the building. Of the numerous artifacts recovered during this excavation, one was instrumental in determining a possible construction date for the building. View of the Huntley Tenant House. View of Southwestern Room of the Huntley Tenant House. A copper-alloy U.S. great coat button (pictured below) was recovered from the builder’s trench within the southwest room. This coat button dates to the 1830s and 1840s and was potentially dropped by someone involved in the construction of the home. This date proved extremely useful for interpretation as the previous estimated date of construction was circa 1880. 1830s–1840s Great Coat Button with Inset Showing 1830s Great Coat (USHistory.com 2017). The presence of this button and other artifacts suggested an antebellum construction date for the dwelling. Also key to dating the structure was the lack of Civil War-era material within the builder’s trench. The Huntley House property “was the scene of a large encampment of Union troops during the Civil War” (Bierce 2002:6; cf. also John Miner and Associates 2003:67–75). Earlier excavation near the tenant house recovered many Civil War-specific artifacts and post-1860 materials across the yard. If the tenant house were constructed after 1880, some artifacts dating to the 1860–1880 period likely would have been dug up during the building’s construction and thus end up in the builder’s trench. The builder’s trench, though, only contained artifacts that predate this period. The tenant house, therefore, potentially dates to the circa 1825–1862 Mason family ownership of the Huntley House property, rather than having been built after the Civil War, as previously thought (National Park Service 1972). This excavation, along with other studies on the property, highlights Fairfax County Park Authority’s dedication to history and the importance of having professionals present during renovations on historic properties. 2002 Historic Structure Report. Schaffer, Wilson, Sarver, and Gray, Reston, Virginia. 2003 Historic Huntley: Cultural Landscape Report. JMA, Charlottesville, Virginia. 1972 National Register of Historic Places Nomination Form. United States Department of the Interior. Electronic document, http://www.dhr.virginia.gov/registers/Counties/Fairfax/029- 0117_Huntley_1972_Final_Nomination.pdf, accessed June 2016. 2017 M1832 Enlisted Greatcoat, http://www.ushist.com/mexican_war/us_military/uniforms/qm-3350_greatcoat_m1832_mexican-war-us.shtml, accessed August 2017.